Omni Slots Vegas Fever Bonus plus 20 free spins. The Omni Slots Vegas Fever Bonus is only valid on sunday May 27th between 00:00 and 23:59. Start your sunday with a bonus of 25%. The players that activate the bonus, receive tomorrow on monday May 28th 20 free spins. All you have to do is make a deposit, activate the bonus and you have 20 free spins on monday. Double pleasure for the players of online casino Omni Slots. Log in on your account between 00:00 and 23:59 hours and claim your bonus of 25%. What are the bonus terms and conditions? To get your Vegas Fever Bonus, you make a deposit on your account of at least €30 euros. Go to step 2 and you can activate there your Vegas Fever Bonus of 25%. This Bonus is only valid on the first deposit of the day, up to maximum €200 euros. Make a deposit of €100 euros and you have 25 euros extra. Make a deposit of €500 and you have €125 euros extra and do you want the maximum bonus of €200, then make a deposit of €800 or more. 20 free spins for Slot Mr Vegas avalaible on monday May 28th. The 20 free spins for the players that have made a deposit of €30 or more on sunday May 27th. Your free spins add automaticly to your account. A welcome bonus of 100% for new Omni Slots players that open a free account via the banner below. This welcome bonus is only valid on the first deposit, up to €300 euros. Send the code 50FREEE after the deposit to customer service via live chat and receive 50 free spins for Starburst. PlaySunny Casino Deposit Weekend Bonus of 25%. Haven’t you activate the PlaySunny Casino Deposit Weekend Bonus yet? Do this before midnight 23:59. A weekend deposit Bonus for the customers of PlaySunny casino. You can activate the bonus without a bonus code. All you have to do is make a deposit and the bonus is available on your PlaySunny account. Maximum 1 bonus per customer between friday May 11th 00:00 and sunday May 13th 23:59 hours. You can only activate the bonus today sunday May 13th if you haven’t activate the bonus yet. Are you registered and you haven’t activat ethe bonus in the last 2 days? Log in on your PlaySunny account and make a deposit of €20 euros or more. The Bonus of 25% will available on your account after the deposit. This time you do not need a special bonus code to activate the bonus. This Bonus is only valid on the first deposit you make in this promotion, up to €100 euros. Make a deposit of €100 euros and this is good for a bonus of €25 euros. Customers that want the maximum bonus of €100 euros, make a deposit of €400 euros or more. Bonus having the bonus terms and conditions. Wager the bonus 35 times before the bonus is released. With a balance of €25 euros or more on your account, your money can paid out. A welcome bonus of 50% on the first 4 deposit you make as new customer. 1st welcome bonus 50%, up to €50 euros plus 25 free spins. 2nd welcome bonus 50%, up to €100 euros plus 25 free spins. 3rd welcome bonus 50%, up to €150 euros plus 50 free spins. 4th welcome bonus 50%, up to €200 euros plus 50 free spins. Monday Ladies Night SlotsMillion Casino with a special Monday Ladies Night bonus of 40% for the female players of online SlotsMillion Casino. The monday night is exclusive for the female players of SlotsMillion Casino. Are you a female and are you a registered player? Have you made since your registration at least 1 deposit? Then the monday Ladies Night Bonus is yours. Make a deposit on your SlotsMillion account and activate your Ladies Night bonus of 40%. This Bonus is only valid for the female players. Are you a male player, then the wednesday night is Gentleman Night with also a Bonus of 40%. To activate your Bonus of 40%, you make a deposit. Make a deposit of at least €25 euros on your account between 7PM and 11PM and you automaticly receive the bonus of 40%, up to €100 euros. This Bonus is valid on every deposit you make as female player and only between 7PM and 11PM. Lunch from monday to friday from 11AM and 1PM with SlotsMillion casino. On every deposit of €20 euros or more, you receive 20 free spins. You will receive the free spins only between 11AM and 1PM from monday to friday. Make 5x a deposit of €20 euros and you have 100 free spins. This promotion is valid from monday to friday so you can earn a lot of free spins after your deposit. Grab your free spins and enjoy your lunch! 10 free spins and a welcome bonus for new players of SlotsMillion Casino. Open a free account via the banner below if you not that registered player. 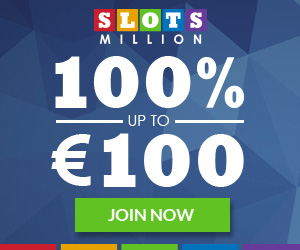 On the first deposit, you receive the welcome bonus of 100%, up to max €100 euros. Then after the first deposit, you receive 100 free spins with 20 per day. 20 on Gonzo’s Quest after the first deposit. Day 2: Twin Spin Deluxe, day 3: Jack and the Beanstalk, day 4: Spinata Grande and day 5: Fruitshop.